Whether you’re a casual foodie or a gourmet cuisine connoisseur, getting your food to taste just right is important, and often, the quality of your creation is dependent on your kitchen utensils. But let’s be honest. Can you really tell what sets apart one sleek KitchenAid appliance from another? You may not be able to, but your wallet sure can. We matched up two popular mixers to help you decide how much money you need to pay to get the mixer of your dreams. For this kitchenware battle, we’re putting the KitchenAid Classic up against the KitchenAid Artisan. 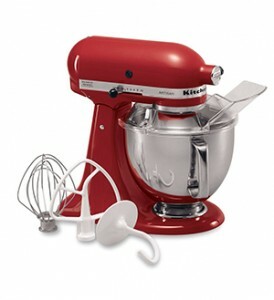 The KitchenAid Classic Series 4.5-Quart Tilt-Head Stand Mixer is a $349.99, multi-purpose kitchen appliance designed to mix, knead and whip a variety of ingredients. A slightly more advanced (and more expensive) model, the KitchenAid Artisan Series 5-Quart Tilt-Head Stand Mixer is a $429.99 device that can stir up everything from cake batter to cookie dough. So is the extra $80 for the Artisan really worth it? Depends on your cooking needs — and your kitchen. Before you buy a mixer, take a look at our Mixer Buying Guide. It’ll help you decide which features are most important to you in a new kitchen appliance. NerdWallet takes you shopping: The KitchenAid Classic Series 4.5-Quart Tilt-Head Stand Mixer is sold in two colors: white and onyx black. The mixer features 10 speeds (to fit every sort of job), a tilt-head bowl (for easy access when adding in ingredients) and a power hub (that fits more than 15 optional attachments). The device’s 4.5-quart stainless steel bowl can mix dough for six dozen cookies, three loaves of bread or six pounds of mashed potatoes in one batch. This model comes with a coated flat beater, coated dough hook and 6-wire whip. Several of its parts are dishwasher-safe, so after all of that cooking, cleanup should be a breeze. 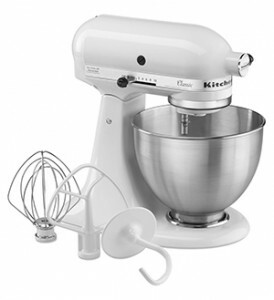 Good fit for: For the more casual cook with a smaller family, opt for the Classic mixer. You’ll be shelling out considerably less for a reliable appliance that still performs many of the same functions as its counterpart. But you can forget about having a colorful kitchen accessory — this one only comes in white or black. NerdWallet takes you shopping: The Classic model’s sibling appliance is the KitchenAid Artisan Series 5-Quart Tilt-Head Stand Mixer. Similar to the Classic, the Artisan features 10 speeds, a tilt-head design and a power hub. But there are differences, too. This mixer’s 5-quart stainless steel bowl makes it better suited for large families. This model has enough space to mix dough for nine dozen cookies, four loaves of bread or seven pounds of mashed potatoes in one batch. The bowl also comes equipped with a handle for easy maneuvering. But a bigger bowl carries a bigger price tag. The Artisan costs $429.99 — $80 more than the Classic. A few more important things to note: The Artisan is sold in dozens of colors. It also comes with a coated flat beater, coated dough hook, 6-wire whip and 1-piece pouring shield. Additional optional attachments can be purchased separately. Good fit for: We recommend the KitchenAid Artisan for avid bakers who will be using their mixer often and for large batches of ingredients. You’ll appreciate the larger capacity (5 quarts compared to 4.5 quarts) and the comfortable handle. 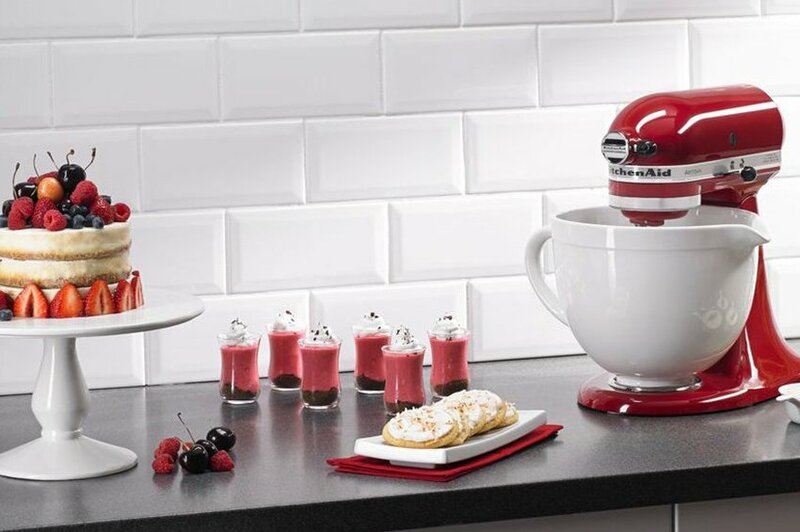 Food for thought: If color and bowl capacity aren’t significant factors in your decision, pick the KitchenAid Classic. It costs less than the Artisan, while still holding nearly the same amount of ingredients and offering most of the same features.